IT PROMISES to be a big year for English rugby as they aim to become world champions and a Bromsgrove resident could be key to achieving that feat. Five months before head coach Stuart Lancaster and his men begin their World Cup campaign, a set of rugby players will touch down in Australia determined to do their country proud. 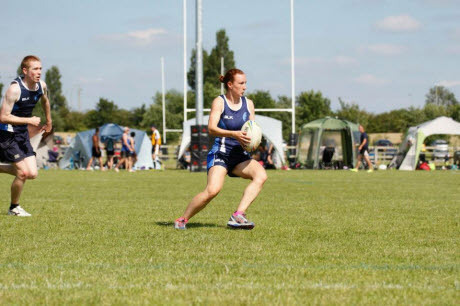 Among those will be Samantha Powles, of Marlbrook, as she has been named in the 16-strong England Senior Women’s touch rugby squad to travel to Coffs Harbour in April. The 28-year-old, who works as a children’s physio in Birmingham, said she was delighted to be selected as she only picked up the sport three years ago. “You give up so much to do the training, so it means a huge deal to be selected to represent my country,” she said. “I started playing through an NHS based team when I used to work at Birmingham Children’s Hospital. “They decided to run a little social touch rugby league to try and get employees participating in more activities and through that I met members of Warwick Touch Rugby Club and it started from there. Australia and New Zealand are likely to be favourites to win the event, which will also see the likes of Austria, Belgium and Chile take part. But Powles said she was hopeful of England’s chances as they look to keep the ball rolling following the women’s World Cup win last year. “I don’t think their victory impacted on touch rugby specifically, but it was great for women’s rugby in general, so hopefully we will carry that on,” she added. Anyone interested in getting involved in touch rugby or looking to donate funds to support the team’s effort should contact Sam on sampowles@hotmail.co.uk.